Amy has left the life she loves for a world 300 years away. Trapped in space and frozen in time, Amy is bound for a new planet. But fifty years before she's due to arrive, she is violently woken, the victim of an attempted murder. Now Amy's lost on board and nothing makes sense - she's never felt so alone. Yet someone is waiting for her. He wants to protect her - and more if she'll let him. As soon as I read the blurb of this book I just knew it was something special. Even the cover looks alluring. I've really started to love dystopian book and as soon as I heard of Across the Universe, I knew it would be a book I would enjoy. I loved Elder instantly and just as much disliked Eldest. They were two completely different people. Elder was great. Caring, kind and lovable he can as just be a great hero. And, It was really nice to see everything through his eyes giving us a glimpse in how he saw everything. Especially when it came to Amy. Revis most certainly portrayed her image beautifully with such simplicity. Amy was a unique character to the book and when her perspective of things came through it made everything even more thriller. I extremely loved the whole murder mystery thing going on and the question of who it could be with many people of possibilities. I had my suspicions and I was relieved when I found who it was. No event was more shocking than the end. That was the point where everything came through and made the book even more awesome. I loved reading this and cannot wait to read more books by Revis! I have heard a lot about this book, I really am gonna have to check it out soon! Thanks for a great review! Sounds very interesting. I'm putting it on my TBR list. I loved, loved, loved "Across the Universe" and too can't wait for the sequel. I loved this book so much. It was different from what I expecting, but I enjoyed it. love de sentence 'i'm the one unplugged you'!! I've been wanting to read this for awhile now...hmmm..there's a murder mystery. Did not know that. I thought I would love this book more than I did, but I did end up liking it. A lot of stuff in the book was pretty shocking, like you said. Nice review! I loved the alternating POV's with this one. I can't wait to read the next book in this series. I loved this book, it was an amazing read! I totally agree with you on the whole Eldest/Elder thing! Great review!! So glad you loved the book! At first I wasn't sure of reading it but after hearing so many good reviews, I think I might! So there is more than POVs in this book? Anyway, I'll try it! I am so glad you enjoyed the book. I was worried it wouldn't live up to everyone's expectations because of how hyped up it was. I haven't read it yet but I know I am going to soon! I really wasn't sure about this book when it first came out but as I read more and more reviews about it it makes me want to read it! I've heard SO MUCH about this book. Love the cover, too. Really need to read it...especially after reading your fab review. I have to say, i am in love with this cover, it is gorgeous! 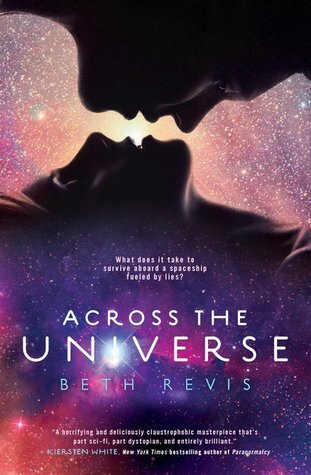 but i have to admit, this is my favourite book - Beth Revis has great writing style, its almost like a poetry to me... i even memorised some quotes: "I have seen stars. Real stars. I will never be the same." I really, really, really, wanna read this book! I was so excited when I first heard of AtU too! It sounded so intruiging and I knew I had to read it! I read an ARC of LOVED it! Elder was such a great character. I am so looking forawrd to A Million Suns, the blurp of it...My oh My! I can't wait! I have been wanting to read this one for a while! Awesome review! I still have yet to read this one, but I keep hearing wonderful things about it. I'm not the hugest fan of dystopian, so I'm not sure if I'd like it. I don't know if it was because I had read book after book and then came to this one or if it was just because I couldn't get into it but after a couple chapters I put it down and never picked it up again. I love how the characters here were really developed. The villains were something else. It felt like a movie. I am so jealous. I must wait - I will swap this book - till the person who will give me this book gets it back (she borrowed it). The story and the cover are so amazing, I CAN'T wait to read this. I *have* heard things about the end. I own this one and I'm looking forward to reading it! I'm just waiting the book in spanish. I've heard that is was going to be translated, but i do not know the dates. Also, after it's translated, i have to wait for it to arrive in my country... so let's say i'll have to wait a lot of time. Anyways, I want to know the final, ¿is it that good? Goooshh i need it.